People tend to gravitate towards the leg press machine on leg day. The leg press is also a popular choice for those suffering from lower back pain. Why? Who knows! Even with the best of form, the constant tension and shortening of the hip flexors combined with the lack of hip extension fuels lower back issues. The leg press targets the quads, hamstrings and glutes. All three of these muscle groups can be effectively targeted through other exercises. 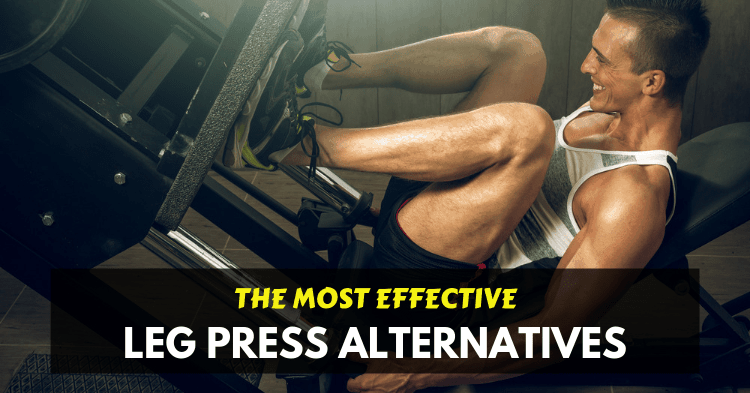 In this article, I will be introducing you to 11 alternatives to the leg press machine that are designed to sculpt and strengthen your pins! Below you will find a range of exercises ranging in difficulty, from beginner to advanced. There is something here for everyone, and something here for every muscle in your lower body. Get ready to kiss the leg press machine (and waiting in a queue to use it) goodbye! This exercise replicates the biomechanics of the leg press in that you are pushing the weight/resistance away from your body. Obviously, the load that one can achieve with a leg press cannot be achieved with resistance bands, but this is a great beginner’s starting point. Hold the other end of the resistance band in both of your hands and bring your hands up to your chest to create maximum tension on the band. Pro tip: This exercise will hit your core too so be sure to not let allow too much arch through your lower back as you straighten your legs – keep your core engaged. If you want to target your quads in a similar way that the narrow stance leg press does, then this is the exercise for you! Like a standard wall sit, but with added weight to make it that much more grueling! If you’re just starting out, try it with your bodyweight for starters. Rome wasn’t built in a day! Have a weight plate of a suitable weight in your hands, ready to go. Stand against a wall and walk your feet out. Lower your body down until your thighs are parallel to the ground, ensuring your knees are behind or in line with your toes. Once in a stable position, place the weight plate on your legs. Broad jumps are great for developing power through the lower body. 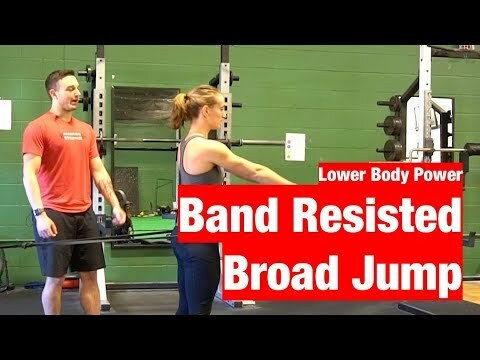 Using a resistance band for your broad jumps will make it extra challenging. This exercise is a complete lower body exercise, targeting your quads, hamstrings, glutes and calves. Attach a resistance band to a cable machine tower at hip height (a long one, otherwise you aren’t going far). Step into the resistance band, placing it around your hips. Walk out, away from the cable machine, until there is tension on the band. Bend your knees, sending your arms backwards and then with as much explosive power as possible, jump forwards creating as much hip drive as possible. You should land in a semi-squat position, bending your knees to absorb the impact of the jump. Walk back towards the cable machine (maintaining tension) and perform your next rep. The exercise we all love to hate – walking lunges! I like to do walking lunges with the maximum weight I can manage, over a smaller amount of reps. This approach to walking lunges will increase the mass building benefits through your quads and glutes. Have a dumbbell in each hand on extended arms by your side. Begin by standing in a neutral stance. Take a large step forward, and then bend both knees to lower your body towards the ground. Ensure that you keep your chest up, your weight in your front heel and your front knee behind your toes. Push back upwards whilst taking your next step forward. Pro tip: Hold the dumbbells in front rack position to increase the load on your quads and get your arms working too. The barbell step-up is a fantastic functional, unilateral, multi-joint exercise that is killer for your quads, glutes (and core). I prescribe this exercise for my clients often, specifically for its balance and symmetry developing benefits. Load a barbell onto your back, as you would for a back squat. Stand in front of a bench or box of an appropriate height (knee height is a good starting place). Step up onto the bench/box with your weaker leg first, driving through your heel and the middle of your foot. Have both feet on the bench/box before stepping down. Your next step-up should be with your other leg. Continue your reps, alternating from one leg to the other. Pro tip: Raise the height of the bench/box to keep this exercise challenging you! Like the barbell step-ups as mentioned above, but with a greater focus on unilateral strength. I find that this exercise and the continuous load on one leg creates a greater level of exertion through the glutes. This exercise can be compared to a single-leg leg press. Have a dumbbell in each hand on extended arms by your sides. Place your weaker leg on the bench (it will stay there until the end of your rep range). Driving through your heel and the middle of your foot, push up to be standing on the bench. Do not rest your other leg on the bench/box – just leave it “in the air” for a second before placing it back on the ground. Do all repetitions on one leg before changing sides. Pro tip: Practice your ‘mind to muscle connection’ – focus on your glutes! Smith racks provide stability which allows you to load up on the weight, more so than in a standard barbell squat. For those of you who love “loading up on weight” like you can do on the leg press machine, this one is for you. The biomechanics of a smith machine squat are like the leg press, but in reverse. Load the smith rack up with an appropriate weight (don’t be too heroic). Stand in the rack with the bar on your back as in a back squat. Have your feet hip width apart. Keep your weight in your heels, engage your core and send your hips backwards, descending into a squat by bending your knees. My advice to you would be to stop once your thighs are parallel with the ground. Push back up to standing position without locking out your knees. Pro tip: Take a slightly wider foot stance to target your inner thighs and hamstrings, as you would with a wide stance leg press. Want to pack some size on your quads? Look no further than the Bulgarian split squat! This exercise places all the tension on one leg at a time – and without placing unnecessary tension on your spine. Stand in front of a knee height bench or box, facing away from it. Place one foot on the bench and hop forward with your other leg until you are in a ‘lunge-width’ stance. Bend both knees to lower your body towards the ground – you should feel tension in your front leg and glute, and a stretch through your back quad and hip flexor. Push back up so that your front leg is straight, without locking out your knee. Biomechanically, the front and back squat are almost the same. However, with the weight loaded on the front of your body rather than the back, it is your quads that get the greater workout as opposed to your glutes. This makes it an effective alternative to the leg press. Load a barbell into front rack positions with the bar across your collar bones, soft hands, wrists flexed back and elbows up. Engage your core and drive back through hips, bending your knees to lower yourself down into a squat. Make sure you keep your chest and elbows up as to not collapse to far forward into the squat, taking the weight off your heels and onto your toes. Push back up powerfully to standing position, squeezing your glutes at the top of the movement. Through optimal hip extension, barbell hip thrusts target your glutes and hamstring. This exercise places a great focus on strength, speed and power. It is imperative that you get the form right when doing this exercise for it to be effective, so pay close attention to the ‘how to’ notes. 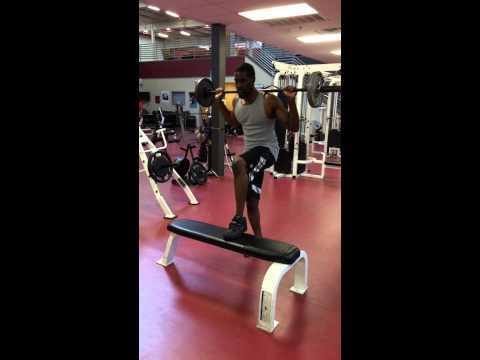 You can use a hip thrust pad to perform this exercise easier. Sit leaning up against a stable bench. Roll a barbell over your lap so that it is in the crease of your hips. Bend your knees and have your feet close to your hips, in such a way that when you push up into your thrust, your knees are at a 90-degree angle. Take a deep breath and then push your hips up until your shoulders are on the bench and your hips fully extended. Squeeze your glutes hard at the top of the movement and hold in this position for a second. Lower back down slowly and repeat. Pro tip: The closer your feet are to your hips, the more you will target your glutes. The further away your feet are from your hips, the more you will target your hamstrings. So, I saved the best for last. This is such a monster exercise, it’s worth waiting for! Note, this is NOT for beginners. What makes this exercise special is the uneven distribution of weight. Although you are pushing weight like in the leg press, this exercise works your muscles in a way the leg press never could. Set up a barbell in a landmine attachment and load it with an appropriate weight. Place a weight plate on the floor in front of you. Facing away from the landmine, place the barbell on one shoulder and place your toes on the weight plate on the floor so only your heels are on the ground. Leaning back into the barbell, bend your knees and lower yourself down into a squat, over a few seconds. Push back up to standing position with power, without locking your knees at the top of the movement. Do all reps with the barbell on one side before repeating on the other side. My legs hurt just writing this article! Whether it be because you don’t have access to a leg press machine, or you simply want to spice up your leg workouts with something different – there’s plenty here to keep you going for a few leg days. You don’t NEED a leg press machine to effectively train your legs. As you can see, there are plenty of amazing alternatives to sitting in the leg press machine, day in and day out. The exercises included in this article target every muscle in your lower body and are good for everything important: strength, power and size.